arker's subsidiary in Newhaven in the UK had been around since 1941 and during that time had produceed a vast number of attractive designs, not found in the US. Especially in the Duofold lines. Throughout the 1970's Parker was struggling to survive, diversifying, among other things they ran the workers agency Manpower. In the pen business they were relying heavily on the top line pens Parker "75", Classic, Parker Falcon and Parker "180", and the lower priced Parker "45", which had been around for years, the Parker "B5", that never really gained any ground and the cheap Big Reds, reminicents of the heyday era of the 1920's, that managed to keep the company afloat. In the early 1970's the UK sales force in Newhaven identified a customer's age group that previously had never been targeted by Parker, 18—30. They decided that they wanted a pen that would appeal to that age group, which potentially held 10 million customers. t should be modern in styling and design but should also be easily identified as a Parker product. The Newhaven Product design and engeneering teams decided that they wanted an outside designer with a proven track record, according to Malcolm Troak in his book Pen to paper. Parker selected Kenneth Grange who had designed a whole range of modern products. He was given a list of specifications. he pen should have as few parts as possible, it should be designed for automatic assembly, the finishing process should be held to a minimum and the repair and servicing requirements should also be minimised. Grange came up with several designs and while they were indeed modern, most were just too modern for Parker but eventually they agreed on an all metal pen with a new one-piece collector, specially designed to handle air travel. The production technique was also relatively new. The body was made with a deep draw press which simply used a round piece of metal, like a large coin, and stamped it in several stages until it was in the shape of an elongated cup. t a sales conference in June of 1975, when the fountain pen business was at it's lowest, Parker UK introduced the cheap, but very functional Parker "25", for the low end market. It was a Flighter, made from steel and plastic, and had easily replaceable nib/sections. The shape of the Parker "25" was a bit odd, since the back of the pen was thinner than the front end, stepped down without really being tapered. It was indeed very square in appearence and sported a new, totally square clip, with the parker logo in a — what else — square plastic emblem. 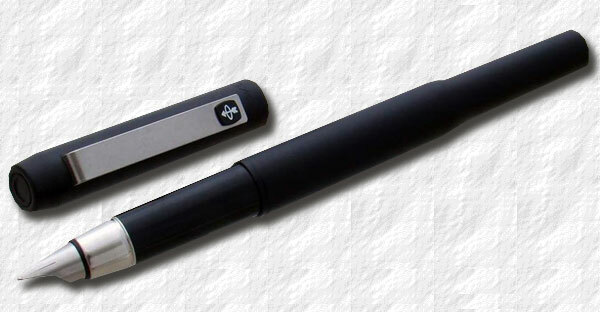 The nib was also in steel but in spite of the low price it was sturdy and proved to be a surprisingly good writer. It was like the Volvo of the time— boxy but safe! A selection of Flighter Parker "25", 1980's. he pen was made to be cheap and the simple design allowed for cheap production costs. It was made as a fountain pen, ball pen and later as a fibre tip and roller ball. It was an instant success in Europe. In 1978 a Matte Black Parker "25" with an epoxy resin finish was introduced in the UK. The same year the british pen also saw it's way into the US catalogue, but it was carefully stated that this pen was made in the UK, while the cartridges and converters were manufactured in the US. The Flighter Parker "25" was offered with the nib sizes of Extra Fine, Fine, Medium and Broad. It sold with a converter installed but with a washable blue cartridge of ink provided for instant use. The Fountain pen cost $10 (at this time a Parker "45" Flighter cost $12.50, a Parker "51" Flighter cost $20, a Parker "180" Flighter cost $30 and a Parker "75" Flighter cost $27.50). As in Europe, the Parker "25" became very popular, since it was an exellent writer with a futuristic design at a nice-price. It was also virtually indestructable. It was advertised as having a "Rugged, functional, space-age design". The Matte Black model really boosted the sales. n 1979 the Matte Black Parker "25" was shown also in the US catalogue, it was referred to as the Parker "25B". Both the Flighter and Matte Black was now offered in the nib sizes Fine and Medium only. Parker discontinued the Parker "45" fountain pen (ball pen and pencil remained but the Parker "45" fountain pens didn't appear again until the mid 1980's catalogues) and bumped up the price of the Parker "25" Flighter. A Fountain pen now cost $12.50 (like the Parker "45" the year before), while a ball pen cost $7.50. The Matte Black was a tad more expensive with $15 for the fountain pen and $10 for the ball pen. In 1981 a Rollerball was introduced. There are several variations of the flighter Parker 25. The most significant is the colour of the plastic trim. The most common are the Black and Blue versions, the Blue being the most common, since it was produced for the whole duration of the model. The Black was made from 1975 until 1994. There are also two rarer colours, Orange (made 1975-1976 only, because of infringement claims from Rotring) and Green. The first MKI Patker 25's had a breather hole in the nib and a flat clip screw, the MKII was missing the hole, MKIII had a "dimpled" clip screw. MKIV was imprinted "Made in UK", as opposed to the earlier versions "Made in England". Date codes were introduced in 1980.
he Parker "25" sold so good that Parker in the US again dared to raise the price of the Flighter in 1980. Now both the Matt Black and the Flighter cost $15 for the fountain pen and $10 for the ball pen, $25 for a set. In the long run it was clear that the Flighter model attracted the most customers so in early 1983 the Matte black was discontinued. As before mentioned times was not really good for pen manufacturers and hadn't been for decades. Parker was losing money. So when The Parker family was made an offer of $400 million from the subsidairy in Newhaven they decided that it was time to pursue other values in life. Hence Parker Newhaven in 1987 took over the Parker mother company. Again it was to be the Duofold that was to boost sales. To commemorate Parker's 100 anniversary the Centennial was introduced and in one year the new Parker company was again making money. he Parker "25" was still featured in the 1989 catalogue but was not depicted in the 1990 catalogue. Examples in collectors hands do however exist with date codes as late as the third quarter of 1994, maybe even as late as 1999, which suggests that production continued, or possibly that stock was being rolled out with new date codes. By then the popular Vector, that introduced the roller ball in 1982, with it's slick, stylized arrow clip, had begun gaining ground, and although quite similar in appearence, the Parker "25" design was beginning to look clumsy and dated in comparison. Nevertheless the Parker "25" still attracts users the world over. Even though it was produced for a very long time they still catch somewhat silly prices at auction sites. Without hesitation collectors pay six times the original selling price for a low-end all-steel pen that is quite common. The black one is even more sought for as well as the uncatalogued White Parker "25"'s, made between 1984 and 1987. Well, I suppose that says something about the quality. I use one myself as an everyday writer and it has never let me down. A Matte Black Parker "25", 1980's. A White Parker "25", 1980's.